Spain’s General Directorate of Taxes (Dirección General de Tributos DGT) has announced it will treat all virtual currencies such as Bitcoin as financial payment methods and thus will be exempt from the VAT rate of 21%. Previously treated as a commodity, Bitcoin users were often taxed twice for purchases using the crypto-currency, however now the recogntion as a ‘method of payment’ means it falls under the same category as cash and credit cards and won’t be subject to extra taxes. The products or services bought with Bitcoins will continue to be subject to their specific VAT rates of course. Spain now joins the UK, Germany, France, Belgium and Finland in accepting Bitcoin as a payment method unlike the USA which still considers Bitcoin as a commodity and enforces the acceptance of Bitcoin as a viable transaction method. 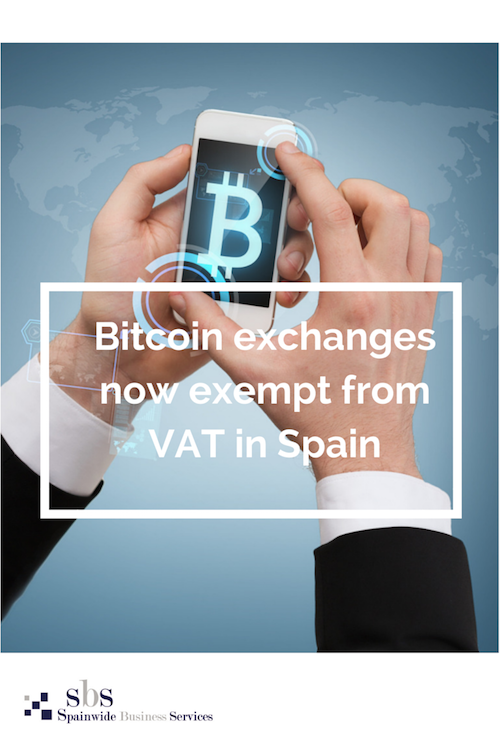 So, Spanish residents are free to buy and sell Bitcoin without paying extra tax, even if buying from EU countries which still tax Bitcoin. With Spanish banks BankInter and BBVA investing in Bitcoin businesses, (such as Bitcoin wallet Coinbase and open source, peer to peer, Bitcoin exchange Coinffeine respectively), the Crypto Currency is gaining momentum and increasing it’s mainstream accessibility to the market. However, the Spanish tax authority Agencia Estatal de Administración Tributaria (AEAT) are keeping a close eye on Bitcoin use, monitoring the Bitcoin flow, to ensure it’s not used for illicit purposes such as fraud and money laundering.